Do a Google search on "variable inductance servo" or "inductive feedback servo" and you will not find anything useful. That alone these days is sufficient to prove that the concept never caught on in popularity. I don't think it is because the configuration is not good, it is just that the problems associated with early potentiometer feedback elements were solved long ago. 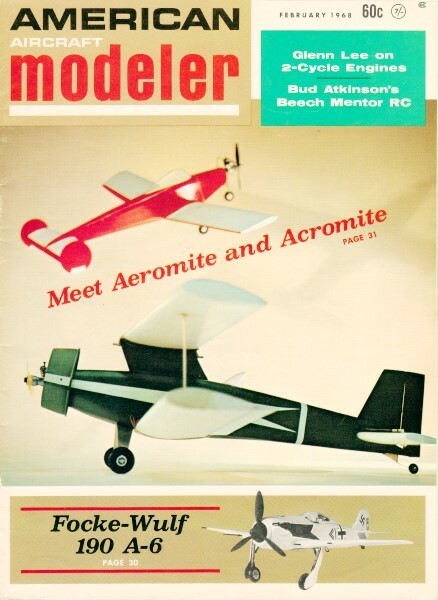 Prima facie evidence of that is seen in the millions upon millions of servos sold yearly for model airplanes, helicopters, cars, boats, and drones. 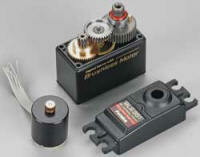 They all use servos with potentiometers mechanically coupled to the rotating output shaft. 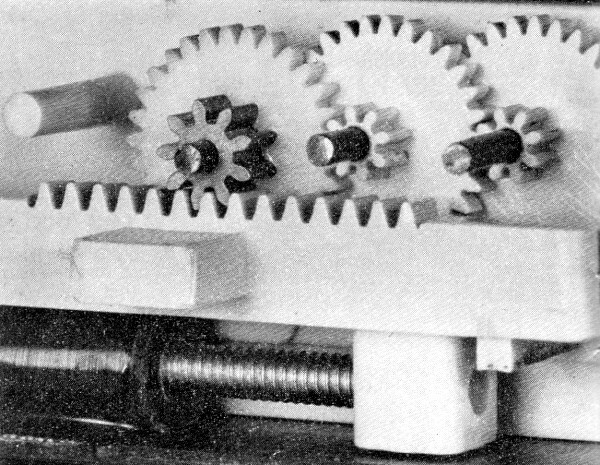 Rotary output servo gear train. BTW, before you are tempted to dismiss the cosine relationship as not being exponential, recall that the Euler identity for cosine is shown above. That said, this article is an excellent example of research and development performed to solve a serious problem and coming up with a workable solution. Many alternatives were tried, including capacitive feedback and optical feedback. Size, weight, and reliability finally excluded all but the variable inductor. I will take this opportunity to say that I have never understood why the servo industry adopted the rotary output (rotating shaft) configuration rather than the linear output (sliding). Because pushrods direct force approximately along a straight line, more movement is produced near neutral rotational displacement, then tapers off according to cos θ as the transmitter control stick is moved. Typical servo rotation is ±60°, so the linear transformation ranges from nearly 1:1 around 0 to 0.5:1 at 60°. Modern computer radios offer the ability to programmatically cancel out that response using what is termed 'exponential response'. This is necessary because the flier usually wants less responsiveness near neutral and more near the extremities because the model flies more smoothly. A linear output servo addresses three negatives: 1) it removes the nonlinear nature of the control surface deflection, 2) the rack and pinion gears driven by a worm gear isolates the motor from the reverse forces placed on the servo control arm, and 3) battery power is not required to counter the aforementioned reverse force on the motor (otherwise the motor might be momentarily backwards to hold the control surface in position). There must be a good reason for it, though. Melanie suggested maybe there is an all-encompassing patent on the linear output servo that would make licensing and manufacturing prohibitively expensive. I welcome input regarding this issue. No accuracy or performance is lost with variable inductance. Output is linear and has 3/4 in. total travel. Easily mounted. Variable inductance is accomplished by moving a bar of iron (a length of 4-40 steel bolt) inside the bobbin of the tightly wound coil on the left. This bar screws into the output arm of the servo and its position is adjustable for servo centering. Design and development of a new kind of feedback servo. An important article for the well-informed enthusiast and the scientifically inclined reader. Feedback control systems, either digital or analog, must utilize some form of feedback component to provide the appropriate reference signal denoting servo output position. Radio control systems have characteristically used the potentiometer as the feedback component, either in the form of a linear wire-wound element or a circular fired ceramic element contacted by wipers. They are subject to performance deterioration caused by vibration, dirt and oxidation, which interrupts contact between the wiper and the element or to more drastic failures caused by breakage of the wire wound or ceramic element. The desirability of replacing the potentiometer with a feedback component which requires no phy­sical contact has long been unquestioned; however, the implementation of other techniques has not been fruitful until recently. Our initial attempts to eliminate the pot problems were directed toward improving it as the feedback element. During this investigation it was found that most of the wear in the pot was not caused by actual control movements but instead was located in a very narrow band around the center position of the servo as the result of control surface flutter being transmitted to the servo assembly through the pushrod. In general, in a system in which the servos have not been periodically rotated between control functions, the R, E, and A servos show markedly greater pot wear than does the throttle servo pot. Samples of all available commercial potentiometers were procured and evaluated for application to feedback servos. We found that some were unsatisfactory for reasons of: 1) Size, 2) Susceptibility to wear, 3) Operating torque, 4) Ease of breakage, and 5) Exposure of wipers to foreign matter. Of the types evaluated, the fired ceramic type with a sealed housing was found best. However, it was felt that the feedback technique still required further improvement. Design Goals. 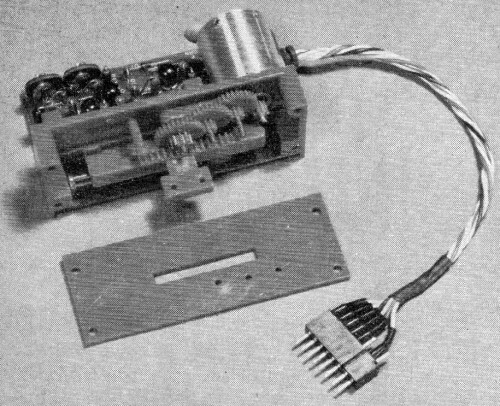 The requirement for any replacement for the conventional feedback potentiometer was established to be: a) No wiping contacts; b) As economical as the potentiometer; c) No more complex than the conventional servo; d) Easy alignment and adjustment; e) Easily manufactured, including ready availability of components; f) Weight and volume not to be compromised. Alternative Approaches. Electronically, the conventional feedback potentiometer is used as a voltage divider. A fixed voltage is applied across the pot and the wiper serves to establish reference voltage as it moves along the element. Arrangement is such that the voltage appearing on the wiper is directly proportional to the position of the servo output arm. In the digital system this voltage is used to govern the duration of a reference pulse generated for comparison with the incoming control pulse and the reference pulse is made to be directly proportional to the actual position of the servo output. 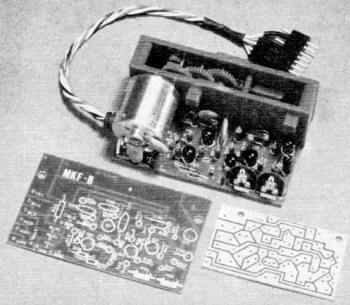 The first approach undertaken was a modification to existing circuitry using a variable capacitor in the monostable multivibrator used to generate the reference pulse. A single-shot, or mono-stable multivibrator, exhibits a pulse duration which is determined by a capacitor-resistor time constant. From a theoretical viewpoint, it is possible to change this time duration by changing the value of either the capacitor or resistor; however, this approach was discarded in favor of using a new design approach which utilizes an induction as the variable component in the reference generator. Servo under construction shows the kit's two etched and printed PC boards whose parts are widely separated for easy assembly. The gear train gives lots of power and speed, three pounds thrust and 0.6 sec. end-to-end movement. A durable and rugged assembly. The next approach involved using a variable inductor in a conventional single-shot. An inductor-resistor also represents a time-constant circuit. It is not practical to substitute a variable inductor directly in a conventional single-shot reference generator because approximately 0.2 henrys of inductance is required. In our application this means that the inductor would weigh at least 4 or 5 ounces, which would, of course, be prohibitive. We next examined the use of light intensity as the variable. This system could be implemented by using a standard light bulb for a light source and using a photodiode or photoresistor as a detector of this light. By placing a sliding screen between the source and the detector and making the screen such that its transparency is a function of the position of the screen, one could achieve an appropriate reference parameter in or at the detector which would be directly proportional to the position of the screen sliding between the light source and the light detector. The author had done some previous work with this type system and found it to be most successful. This type technique would satisfy a great majority of the requirements established for the servo feedback element; however, it was determined that there were four deficiencies which made the technique impractical: a) Limited bulb life and catastrophic failure with no warning; b) Poor vibrational environmental characteristics; c) Excessive battery drain required to drive the light source; d) Impractically expensive. Aircraft AC autopilots commonly use an inductor known as the linear variable differential transformer as the feedback component. Some basic experimentation proved this to be impractical in our application. The differential transformer required is large and has multiple windings, is difficult to produce or procure. Design of Preferred Alternative. It was concluded that any further attempt to use inductive or capacitive feedback would have to involve new reference circuitry instead of the conventional single-shot reference generator and, further, that they could not be used in their conventional timing sense. It is required that the digital servo operate on a delay on the order of one millisecond because the FCC regulations limit the band width of our equipment. Any further decrease in the delay means that the limit would be exceeded. The use of a variable inductor in a new timing circuit was investigated next and proved to be an acceptable approach. It seemed reasonable that one could use the reverse induced EMF which appears across an inductor when the current in the inductor is changed. Going back to basic electronics, you will recall that if a steady state DC current is established in an inductor, and then is interrupted, or turned off, a voltage is induced across the terminals of the inductor. The magnitude of this voltage is a function of the magnitude of the current which was being passed through the inductor and the speed with which the current was turned off. It is also a function of the actual inductances of the coil itself. The formula for this induced EMF is E = L di/dt. Because the inductance is a function of the permeability of the magnetic flux path, it is quite simple to change the inductance of a given coil by moving an iron core in and out of the coil. For example, this same mechanism is used in the RF coils which are used to tune the receiver in radio control systems. Visualize an inductor wound on a straight hollow form with an iron core moving in and out of the coil and you have an inductor whose value of L is dependent upon the position of the core in the coil. In the servo application, this core could be rigidly attached to the moving output arm of the servo while the coil would be fixed to the stationary portions of the servo. Hence, the position of the core would be determined by the position of the servo output, hence the value of inductance would be proportional to the position of the servo. By passing a fixed DC current through the inductor, and then turning it off abruptly, a voltage would be induced across the terminals of the inductor with the magnitude of the voltage proportional to the position of the servo. By properly designing the electronic circuitry, we produce a voltage proportional to servo position and achieve a feedback element which does not require wiping contacts. The problem remaining is to generate, from this induced voltage, the time delay approximately of 1 millisecond and, at the same time, maintain a direct relationship between the magnitude of the induced voltage and the duration of the time delay. Mechanization of the preceding approach has been successfully achieved in the Titan Magnevac servo. In order to discuss this mechanization, refer to the schematic. The general functions of the different portions of the circuitry are as follows: Q1 is an input buffer and amplifier. Transistors Q2, Q3, Q4 with the variable inductor, L1, and associated resistors and capacitors, form the reference pulse generator. Diodes D70 and D71 form the comparator gate for one direction of servo travel, and D50 and D51 and resistor R52 form the comparator gate for the other direction of travel. Q5 amplifies and inverts the output from the latter half of the comparator. Transistors Q7, Q9, Q11 and Q13 form a pulse-stretching network and the driver transistor which causes the motor to run in one direction and transistors Q6, Q8, Q1O, and Q12 produce the opposite direction of travel. Let us now investigate the operation of transistors Q2, Q3, and Q4. The inductor L1, is the feedback element and is located in the emitter leg of transistor Q2. Resistor R20 (4.7K on the base of Q2) biases Q2 ON so that, in the normal quiescent state, transistor Q2 is conducting and draws a steady state DC current of about 3 milliamperes through inductor L1. Q3 and Q4 are cross coupled in the basic Schmidt trigger configuration with transistor Q3 biased ON and Q4 biased OFF. 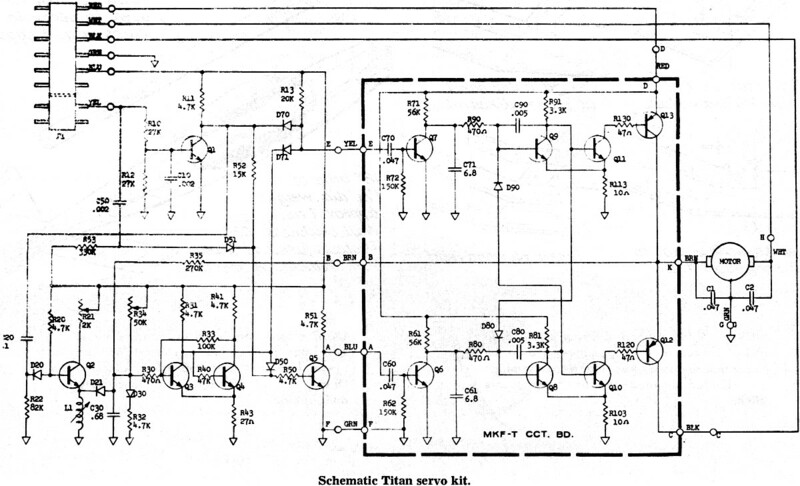 The collector of transistor Q3 is the output of the reference generator and is coupled into both comparator gates. With Q3 biased normally ON, the output, or collector of Q3, is at or near ground potential. The reference generator is triggered once each frame by the command pulse routed to each servo via the yellow lead of connector P1. This is a positive going signal whose duration (width) specifies commanded servo position and is the one millisecond duration mentioned earlier. This pulse turns on transistor Q1, thereby generating a negative going pulse with a duration of 1 millisecond on the collector of Q1. The rise and fall of this negative going pulse is differentiated by C20 and R22 to form first a short negative going spike, and then a short positive going spike 1 millisecond later. The negative going spike is coupled through diode D20 to the base of Q2 and turns Q2 OFF i.e., causes it to stop conducting. This means that the current has abruptly ceased to flow through inductor L1 and a reverse voltage is induced across L1. Thus, the top of L1 (the emitter of Q2) is caused to go negative for a short duration. The magnitude of this induced voltage is dependent upon the position of the core in the inductor L1. When the servo is at one end of its travel and the core is only slightly projecting into the coil of L1, this induced voltage is in the order of minus 20 or 30 millivolts. However, at the other end of its travel, when the core is projecting entirely through the coil of L1, the magnitude of this voltage is as much as minus 200 millivolts. This negative going voltage peak is coupled through diode D21 into capacitor C30, and, because of the low resistance of the inductor L1 and low forward resistance across diode D21, capacitor C30 is caused to discharge abruptly. When the voltage decays across L1 and the emitter returns to its DC level, diode D21 becomes reverse biased. The positive going time constant (decay time) for capacitor C30 is determined primarily by the resistance value of trimming potentiometer R34. This causes capacitor C30 to recharge toward 6 volts with a time constant which is determined by C30 and (primarily) R34. The fact that the junction between C30 and R34 has abruptly become a negative voltage has caused Q3 to be turned off, thereby causing its collector to go positive. This action causes Q4 to be turned on. The base of Q3 now recharges toward 6 volts until Q3 is again caused to conduct, and through the Schmidt trigger action, Q3 quickly turns back on thus turning Q4 off. One cycle of operation of the reference generator in now complete and the output, or collector of Q3 has changed state for a period of approximately 1 millisecond. As the core is moved further into inductor L1, the negative induced voltage becomes greater, thereby causing capacitor C30 to be further discharged. Since capacitor C30 recharges at a constant slope, it can be seen that for larger negative voltages, we generate a longer time delay during which transistor Q3 is off. This is the basic mode of operation of the Magnevac timing circuitry. A U.S. patent is pending on the circuitry around Q2, Q3, and Q4 and should be granted very shortly. The remaining circuitry of the servo is more or less conventional. Position of the servo is a function of the input pulse width. The reference pulse is compared to the input pulse, and the appropriate pulse stretching and driver chain is turned on depending on whether the commanded pulse is wider or narrower than the reference pulse. This process is repeated once each pulse repetition period until the widths of the reference and commanded pulses coincide to produce a nulled condition. A photograph shows the mechanical arrangement of the inductor and the core. Notice that the inductor itself is a coil-form which is attached rigidly to the printed circuit board of the servo. The core that moves in and out of the inductor is a soft steel continuous threaded 4-40 rod with a screw driver slot in one end for adjustment. The slug threads into the post which is an integral part of the output rack. When the rack or output arm of the servo moves, the slug moves with it, in and out of the inductor. The center position of the servo is readily adjusted by screwing the core into or out of the post. If this adjustment is performed with a nonferrous screw driver, the position of the servo can be adjusted for proper centering while the servo is operating. The resolution of this adjustment is exact. Servo Development. Referring again to the schematic you notice that both R21 and R34 are potentiometers which provide for adjustment. R21 adjusts the DC current which flows through the inductor to change the absolute magnitude of the voltage induced across L1 when transistor Q2 is turned off. R34 controls the recharging time for capacitor C30. Thus, adjustment of R34 changes the slope with which C30 recharges toward 6 volts. Hence, it is possible to adjust both the end and the center positions of servo travel. Extensive testing has established that the linearity of the inductive feedback principle is better than one-half percent as measured against the theoretical straight line. Linearity is lacking only at the extreme ends of the coil-form. This is due to the fringing effect of the magnetic field at the ends of the coil. However, since servo travel is restricted to 3/4 in. and the coil is a full one in. long, the fringing, or end effect, is not observed in normal operation. 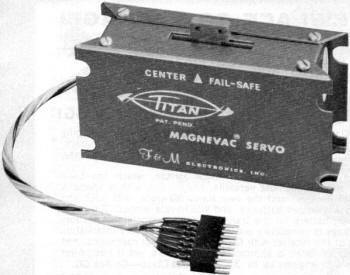 The final version of the Titan Servo was designed to provide a full 3/4 in. permissible travel on the output arm and a transit time of about 0.6 seconds end-to-end. The thrust is 3 1/2 pounds. The case is made of 0.032" half hard aluminum anodized blue and is mountable on three sides. The case has proved to be extremely durable and most resistant to crash damage. The size of the Titan Servo is 1 1/16" thick by 1 3/4" high by 3 1/4" long including mounting lugs. The variable inductance servo is available in a wide range of models for use with most major brands of digital equipment today. 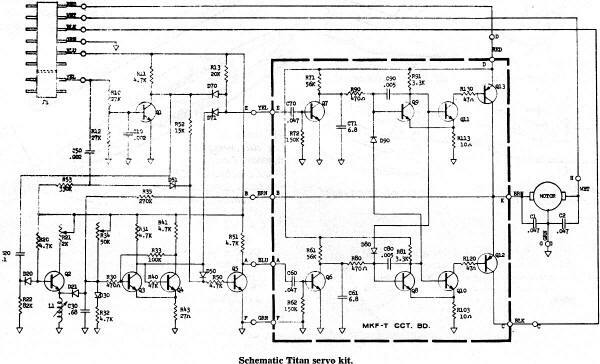 Schematic from Titan Servo Kit.